The Dermaroller is a medical device used to break down old scar tissue and stimulate formation of new skin cells and supporting structures (collagen and blood vessels). The Dermaroller is a drum like device on which multiple micro needles are attached. The Dermaroller is a simple treatment. The skin is cleaned and if necessary, a numbing cream is applied. Once the skin is suitably numb, the dermaroller is rolled over the affected area till a uniform redness is visible. The dermatologist may also suggest application of some actives like Platelet rich plasma, growth factors at this time. The redness typically lasts a few hours before fading away. The Dermaroller treatment is usually done after using a skin numbing cream, so it is well tolerated. At Dr. Dixit’s, you also have the choice of using a dermastamp or dermapen device which is as effective and relatively painless. There is often some redness and swelling at the end of the treatment. This usually settles down in a few hours to a day. You are advised to use sunscreens and moisturisers for a few days after treatment. How often should the Dermaroller treatment be repeated? Dermaroller treatments for acne scars and rejuvenation can be repeated as often as once a fortnight till desired results are obtained. Are there different types of Dermaroller? Yes, there are differences in Dermaroller based on needle length. The smaller ones are used for the scalp and the longer ones for acne scars. 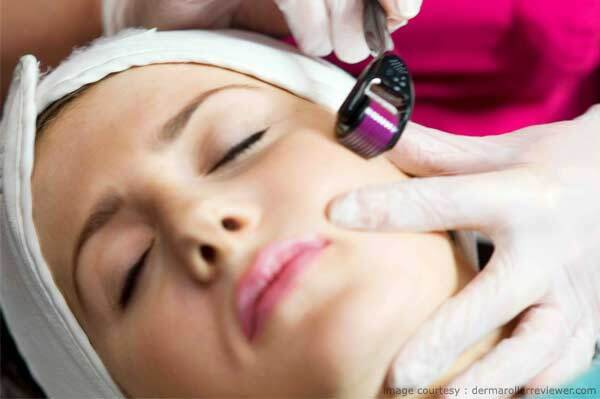 Recently, a device known as Dermapen has become very popular as it reduces the pain associated with Dermaroller. How does the dermaroller help in acne scars? The Dermaroller causes a controlled micro injury to the skin, which in turn stimulates the formation of new collagen. This improves the appearance and texture of the scars. The treatment also bring new blood vessels into the scar area helping in rejuvenation of the skin. These treatments also reduce the pigmentation associated with acne scarring. How does the dermaroller help in skin rejuvenation and antiageing? The Dermaroller increases the thickness of the skin by stimulating formation of new collagen. This leads to an improvement in the texture of the skin and reduction of wrinkles. There is also new blood vessels which drive nutrients into the skin, and the treatment help reduce the pigmentation as well. How does the dermaroller help in hair loss? The scalp is a thick tissue, and most of the hair stimulating molecules need to be delivered to the hair follicles base which is about 0.5 mm deep. The Dermaroller helps delivering these molecules by creating microchannels through which the actives can directly reach their point of action. The treatment also increases the blood flow into the scalp, this brings more nutrition to the hair roots. This treatment is one of the safest medical treatments. There are virtually no side effects as this treatment is safe in all skin types. However, make sure that a trained dermatologist is performing the treatment.